Steve Bannon. Image, Gage Skidmore, some rights reserved. - Banks asked Cambridge Analytica “to come up with a strategy” for his Leave.EU campaign to raise funds in the United States months before the Brexit vote. Donations from overseas are not permitted under British law. - Cambridge Analytica was given access to personal information about British voters from Banks’s Leave.EU campaign, including access to social media accounts and call centre data. Banks has previously claimed to parliament that "the only data that was ever sent to Cambridge Analytica was from UKIP”. The revelations come as Banks is poised to play a key role in pushing for a hard Brexit. On Twitter, Banks’s Leave.EU campaign has declared “May must go!” and has encouraged supporters to join the Conservatives to force the prime minister out of office. 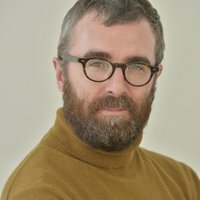 A number of the emails obtained by openDemocracy are expected to be published as evidence by parliament's inquiry into fake news this coming week. Commenting on openDemocracy's revelations, Damian Collins, chair of the inquiry said: "This is more evidence that Arron Banks misled the select committee when he gave evidence to parliament. "Here we can glimpse how these secret connections were being planned and discussed; the incubation of a political virus involving key people, data, money and consultancies like Cambridge Analytica. He added: "Why was (Banks) seeking support from Cambridge Analytica with fundraising in America if all the money for Leave.EU came from his own resources? These emails should form part of the NCA investigation into Arron Banks’s finances. "The emails also show that contact between key Trump aides like Steve Bannon, and men like Arron Banks, was not just passing, but that they were working together through and involving common businesses, like Cambridge Analytica." Dr Emma L Briant, who has submitted similar evidence to the parliamentary committee, said: "Leave.EU funder Arron Banks denies claims that he may have received Russian money for Brexit. This new evidence shows that Banks was seeking foreign funding for Brexit from the very beginning." "The emails also reveal new evidence of what constituted Banks’s ‘two stage’ plans for LeaveEU involving Cambridge Analytica. If he did not need their services, why did he go to them? The Electoral Commission must re-open their investigation into Leave.EU, as this evidence reignites questions of whether undeclared services were part of the campaign." Cambridge Analytica, which initially came to prominence for its role in the 2016 Trump campaign, was wound up after the Observer newspaper revealed that it had harvested data on tens of millions of Facebook users and engaged in ‘black ops’ political campaigns around the world. The National Crime Agency announced that it was investigating Banks earlier this month after the UK elections watchdog reported concerns that the £8.4m Banks spent on the Brexit campaign – the biggest single donation in British political history – came from impermissible sources outside the UK. Banks has denied this. openDemocracy recently revealed that Banks misled parliament by saying that Leave.EU and his Eldon insurance business were separate businesses. We also showed that his insurance staff had access to personal information on tens of millions of voters of British voters gathered from electoral rolls from across the UK. Banks has denied misusing any data. However the new emails leaked to openDemocracy provide a much clearer picture of the relationship between Arron Banks and Cambridge Analytica than has previously been known. In August 2016, just a few weeks after the Brexit vote, Steve Bannon, then Donald Trump’s campaign chief, invited Banks to a political fundraiser in Mississippi. This was not Banks’s first engagement with Bannon. Almost a year earlier, it was Bannon who brought Cambridge Analytica and Banks’s Brexit campaign together. Just a month after Leave.EU was founded, communications seen by openDemocracy indicate that the former Breitbart chief introduced Banks to Alexander Nix, Cambridge Analytica’s onetime CEO, and arranged a follow-up phonecall between Banks and Cambridge Analytica. Bannon and Nix were together in the US on this call, along with other staff from the data analytics firm. 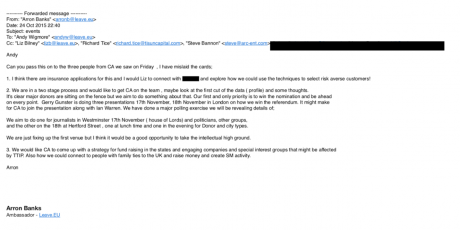 On 24 October, the day after the scheduled meeting with Cambridge Analytica, Banks, in an email sent to some of his closest associates, said that he “would like CA to come up with a strategy for fund raising in the States and engaging companies and special interest groups that might be affected by TTIP (Transatlantic Trade and Investment Partnership)”. Steve Bannon was among the email’s recipients. Donations to British political causes can only be made by individuals who are on the electoral roll or UK-based companies. In early December 2015, Banks was quoted in the Independent describing the proposed TTIP trade deal as “a disaster” and boasting that he was working with Cambridge Analytica to “boost Leave.EU’s social media campaign”. Banks has said that he did not sign a contract with Cambridge Analytica and that no work was completed, as Leave.EU did not win the official designation as lead campaign in the Brexit referendum. Banks came to prominence as a political donor in 2014 when he pledged to give £1 million to UKIP. The Eurosceptic party also had connections with Cambridge Analytica. Not long after Steve Bannon introduced Banks to Cambridge Analytica, UKIP staff were being asked to provide the data analytics firm with political data, including information from the electoral roll. Banks told MPs in parliament in June that "the only data that was ever sent to Cambridge Analytica was from UKIP”. But emails obtained by openDemocracy suggest that around the same time Cambridge Analytica was working with UKIP, the firm was also engaging in very similar contact with Leave.EU. In October 2015, a Cambridge Analytica employee wrote to Leave.EU CEO Liz Bilney asking for data about subscribers and donors, a database of calls from the Leave.EU call centre (“particularly with the ‘Notes’ included”) and login details for the group’s Facebook and Twitter accounts. 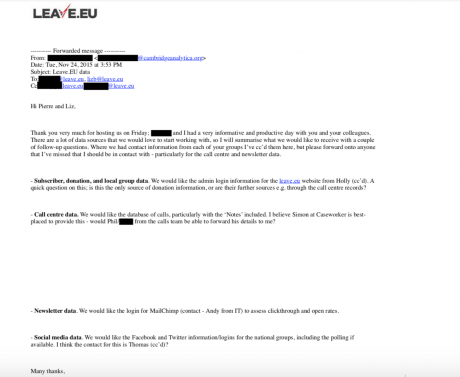 A Leave.EU employee responded to Cambridge Analytica with details of how all this data could be accessed. Internal Leave.EU workflow documents seen by openDemocracy also suggest that the data analytics firm was given access to this Leave.EU data. The following month, Cambridge Analytica operations director Julian Wheatland wrote to Arron Banks and his spokesperson Andy Wigmore, citing “our proposal for Phase 1 support to the Leave.EU campaign”. Wheatland said that he would “meet with members of the UKIP data team tomorrow to understand and share available data and prepare to start analysis”. 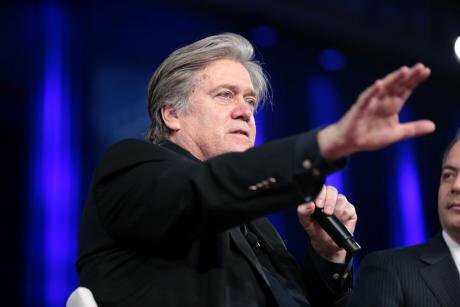 Once again, former Trump chief strategist Steve Bannon was among the recipients of the Cambridge Analytica email. The company’s initial proposal to Leave.EU was published earlier this year in testimony given to parliament’s ‘fake news’ inquiry by CA whistleblower Brittany Kaiser. The new emails suggest that there were discussions about how Cambridge Analytica could work with Banks’s insurance business. In November 2015, a Cambridge Analytica employee wrote to Banks saying that the company was drawing up project proposals for, amongst other things, “concurrent work on how we help the Party and your insurance company. We will have some documents to you before the end of this week." Documents that we have seen confirm that Cambridge Analytica conducted its initial phase of data analytics, priced at £41,500, at the request of Leave.EU, although both they and Cambridge Analytica deny that final work products were provided, due to payment not being made. 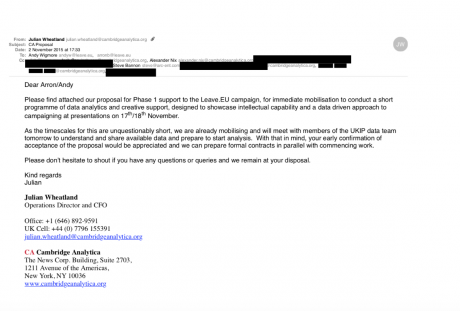 Cambridge Analytica later issued an invoice to UKIP for this work, and Banks made a donation to UKIP of a similar amount to the party months later, but UKIP have claimed that they never paid the invoice either. Banks initially boasted of Cambridge Analytica’s involvement in his Brexit campaign. In his book ‘The Bad Boys of Brexit’, Banks says that in October 2015 Leave.EU hired Cambridge Analytica, a company that uses “big data and advanced psychographics” to influence people. In November 2015, Leave.EU said on its website that Cambridge Analytica “will be helping us map the British electorate and what they believe in, enabling us to better engage with voters”. In the same month, Cambridge Analytica director Brittany Kaiser spoke at a Leave.EU news conference. She said her organisation would be “running large-scale research of the nation to really understand why people are interested in staying in or out of the EU”. Arron Banks and Andy Wigmore have so far not responded to questions from openDemocracy.